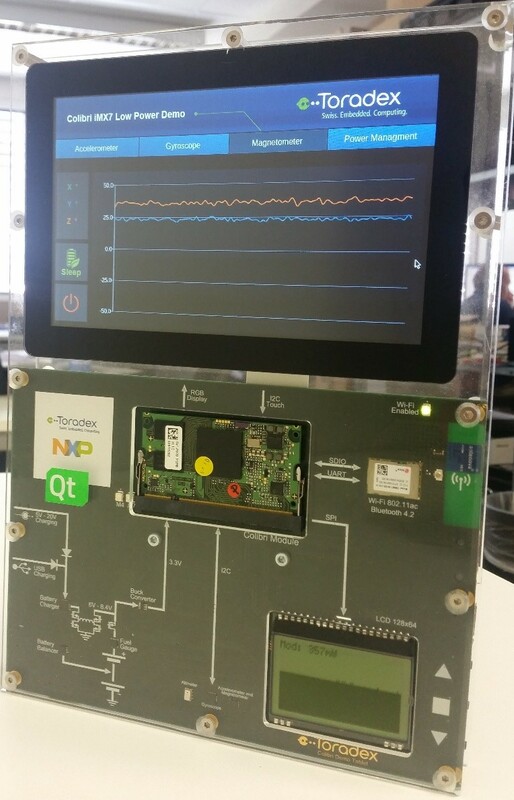 This is the fourth and final of a 4-part blog post series which provides a broad overview of the application of lithium-ion batteries in embedded systems. Take a look at parts 1, 2 and 3 here. In the first place, the software development team wants to show the heterogeneous multicore processing within the Colibri iMX7 on Arm Cortex-A7 and Cortex-M4 core with this demonstration board. On the Application core an Embedded Linux Operating System and on the smaller M4 core a small FreeRTOS Real Time Operating System is running. We will use this demo to present a possible solution for our topic on using lithium-ion batteries. The low power demo has its name because we switch off the Cortex A7 core and only run some sensors and a small SPI-based LC Display with the i.MX 7 M4 Core. The next image shows the block diagram. More information about heterogeneous multicore processing can be found on our online available webinars and developer articles. 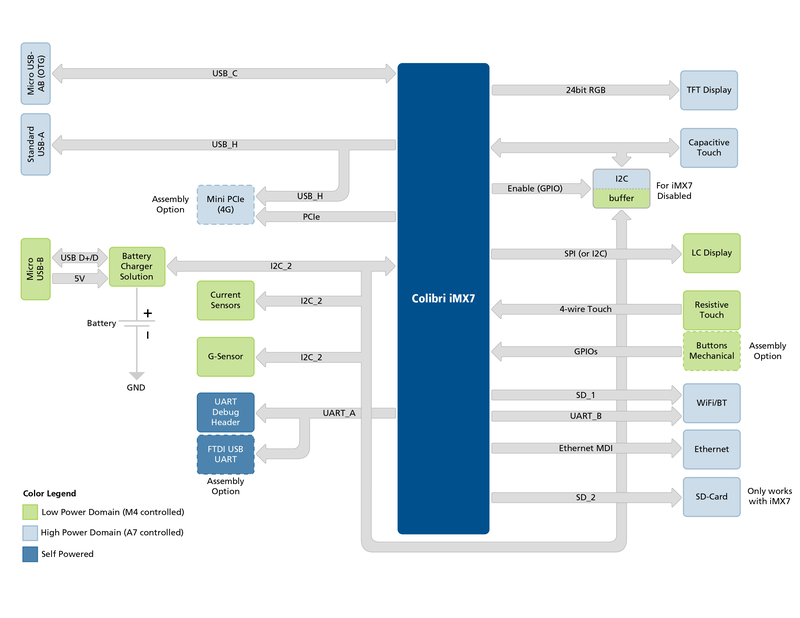 From our Colibri iMX7 datasheet we know that the module needs at most 300 mA at maximal CPU load. As I recommended previously, we will use two removable cells in series, instead of more dangerous parallel connection. 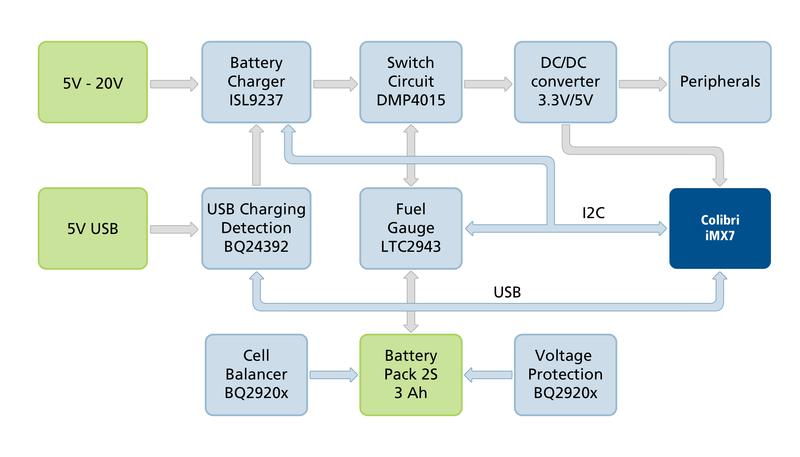 We apply TI’s BQ2920x voltage protection with automatic cell balance for 2S lithium-ion batteries. The balancing can be controlled externally. For the demonstration board, it is alright to have an autonomous passive balancing like you can find on almost all consumer devices. I would recommend controlling the balancing with the enable pin, and only balance at higher SoC levels to avoid permanent and premature discharging. We want to measure current, voltage and temperature with the multicell battery gas gauge LTC2943 from LT and send the information to the M4 core via I2C bus and show the actual State of Charge on the SPI controlled LC Display. This device has an accurate coulomb counter with a 14-bit delta-sigma analog-to-digital converter. For the system rail buck converter, we use TI’s TPS56x219 as an example. It has a wide input voltage range to cover the whole battery voltage range. We want only to use USB BC 1.2 standard, where the voltage remains at 5 volts. Therefore, TI’s BQ24392 is used as the battery charging detection IC. I recommend reading through its datasheet and have a closer look at the charge detection block diagram. The centerpiece of the charger circuit is ISL9237 with a buck-boost converter, so we can use USB’s 5 volt and external 5 to 20 volt DC supply for charging the batteries, as it is shown on the illustration. That is a very deluxe solution. It satisfies the demanding requirements and shows what is possible. However, for a normal use case, I recommend using only one DC power supply with a constant voltage level which is higher than the highest battery voltage. On the other hand, it is possible to use only a 5V charging input for USB and DC power supply. In this case, a simpler charger can be evaluated, which has boost converter topology. I hope that the presented solution is comprehensible and gives you an easy starting point for your own solution. Again, that is only one solution out of several billion and could be more optimized for cost and energy efficiency. However, this example shows that is simple to use rechargeable lithium-ion batteries to supply an embedded system. With our modular approach, it is not a big deal to extend the carrier board with additional electrical components to provide such a solution. If something is not clear or you need more information, please don’t hesitate to write to us. I am happy to get in contact with battery management system experts.